When it comes to elective cosmetic surgery, patient safety is at the forefront of a Dr. Hayes's mind. However, as with all surgical procedures, complications can occur, and most insurance companies do not cover the related medical expenses. 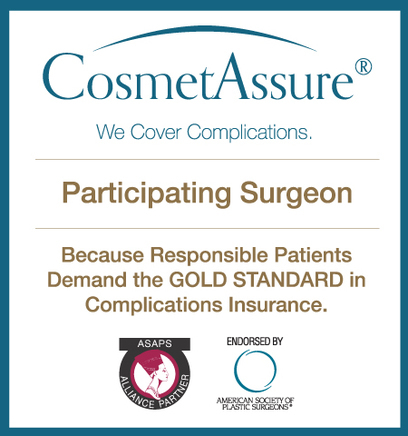 As a cosmetic patient of Dr. Austin Hayes, your scheduled surgery includes CosmetAssure coverage. CosmetAssure provides you with insurance coverage in the unlikely event a complication occurs. CosmetAssure is exclusively available to members of the American Society of Plastic Surgeons or The American Society for Aesthetic Plastic Surgery. Selecting a surgeon such as Dr. Hayes, who is a member of ASPS, is one of the best ways to be assured of a positive experience and successful outcome following cosmetic surgery. Membership in either of these elite associations indicates that a surgeon’s expertise and credibility have met the highest level of industry standards. A surgeon’s CosmetAssure program includes coverage for all of their cosmetic patients having one or more of the covered procedures. Talk to Dr. Hayes and his staff today about this valuable insurance, or click here to learn more. Austin Hayes, MD is one of the few plastic surgeons in the area to provide this important cosmetic surgery insurance. Without CosmetAssure, you may be left with a financial burden should an unexpected complication arise after surgery. With CosmetAssure, you have the peace of mind of knowing that Dr. Hayes has taken the precautionary steps to cover you in the event of a financial loss caused by post-surgical medical bills.